For Thursday’s report from the Royal College of Physicians and Surgeons of Canada, titledToo Many, Too Few Doctors? Whats Really Behind Canadas Unemployed Specialists?researchers interviewed more than 40 people with in-depth knowledge, such as deans of medical schools and hospital CEOs, and conducted an online survey of 4,000 newly graduated doctors. Among respondents, 208 or 16 per cent reported being unable to secure employment, compared with 7.1 per cent of all Canadians as of August. Urologists, critical care specialists, gastroenterologists, ophthalmologists, orthopedic surgeons and general surgeons, and doctors from other sub-specialties were among those who said they were unemployed. The report’s authors said there were three main drivers: More physicians competing for fewer resources such as operating rooms and hospital beds at the same time that relatively weak stock market performance meant many specialists were delaying their retirement. Slower job growth for specialists as the health-care system in some cases substitutes other health professionals such as nurse practitioners and physician assistants for physicians. Established specialists may also be reluctant to share resources such as operating room time. Lack of adequate career counselling and personal choices about type and location of practice when new graduates have family responsibilities (spousal employment, caring for children or elderly parents) that make it harder to move to job opportunities. Half of respondents in 2012 said they hadn’t received any careercounselling. Dr. Christine Herman is a recently trained cardiac surgeon. She is like about 31 per cent of new specialists who said they chose not to enter the job market but instead pursued more training, which they hoped would make them more employable. Herman said medical schools and the provinces and territories need to do a better job of workforce planning. Sixteen per cent of newly trained specialists said they couldnat find work when surveyed over a two-year period by the Royal College of Physicians and Surgeons of Canada. This number was compared to a national unemployment rate of 7.1 per cent when the report was being prepared in late summer. In B.C., the number of unemployed specialists was slightly higher than the national average at 16.5 per cent. The findings are counter-intuitive, given patient complaints about accessing timely care and surgery. aNever in my medical career have I even heard of unemployed doctors, until now, so this comes as a real surprise,a said Dr. William Cunningham, president of the B.C. Medical Association. Cunningham has been practising medicine since 1986 and works in a hospital emergency department on Vancouver Island. 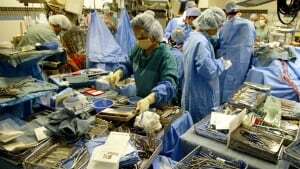 The report doesnat address the issue of whether there are too many specialists for the Canadian health care system, in which operating room time and budgets are fixed. But it makes it clear that doctors are competing for resources, including operating rooms, hospital beds and money to pay their fees. The report also pinpoints reasons why newly certified specialists are having trouble finding work: older doctors are delaying retirement; established surgeons are protecting their precious (often only one day a week) operating room time so young doctors arenat getting the hospital/surgical positions they covet; and a lack of cohesion in medical resource planning and coordination between medical schools, governments and hospital or health care authorities. As well, there are relatively new categories of health professionals encroaching on doctorsa territory, such as advanced practice nurses, nurse practitioners and physician assistants. Respondents to the survey were graduates of Canadaas 17 medical schools and/or Canadian residency training programs in fields such as cardiac surgery, neurosurgery, nuclear medicine, ophthalmology, radiation oncology, urology, critical care, gastroenterology, general surgery, hematology and medical microbiology. The report does not include data on family doctors. While about one in five specialists or subspecialists said they are having challenges finding jobs, another 22 per cent of newly certified specialists said they are taking locum positions or other various part-time positions. Locums assume another doctoras duties during holidays or extended absences.